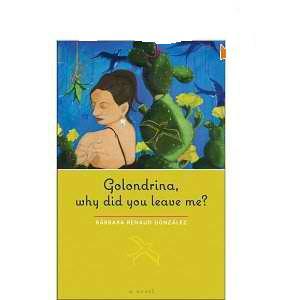 LATINA BOOK CLUB: BOOK OF THE MONTH: GOLONDRINA, WHY DID YOU LEAVE ME? BOOK OF THE MONTH: GOLONDRINA, WHY DID YOU LEAVE ME? The golondrina is a small and undistinguished swallow. But in Spanish, the word has evoked a thousand poems and songs dedicated to the migrant's departure and hoped-for return. As such, the migrant becomes like the swallow, a dream-seeker whose real home is nowhere, everywhere, and especially in the heart of the person left behind. The swallow in this story is Amada García, a young Mexican woman in a brutal marriage, who makes a heart-wrenching decision--to leave her young daughter behind in Mexico as she escapes to el Norte searching for love, which she believes must reside in the country of freedom. However, she falls in love with the man who brings her to the Texas border, and the memories of those three passionate days forever sustain and define her journey in Texas. She meets and marries Lázaro Mistral, who is on his own journey--to reclaim the land his family lost after the U.S.-Mexican War. Their opposing narratives about love and war become the legacy of their first-born daughter, Lucero, who must reconcile their stories into her struggle to find "home," as her mother, Amada, finally discovers the country where love beats its infinite wings. ABOUT THE AUTHOR: BÁRBARA RENAUD GONZÁLEZ is an award-winning writer, independent journalist, and activist who lives in San Antonio.